I never relay where I work on my blog. Or on social media. Why do I do that? Because anything I post is my opinion alone, and doesn’t relate in any official capacity to my work. All I will say is that right now I am BORED OUT OF MY FREAKING MIND, since I have been unable to report to work for the last 3 weeks. And as time passes, that boredom is gradually transforming to being PISSED OFF. PISSED OFF at our elected officials who can’t do their jobs, and allow others to do theirs. So instead of working on a journal paper I REALLY need to finish, instead of creating graphics to support that paper…I made this graphic. Showing how complete unrepresentative our political representatives are, particularly if you’re in the GOP. 88 PERCENT of the GOP House and Senate are white males. Mostly RICH white males, who’s life experience can’t possibly relate to the hardship they’re causing millions of Americans right now. 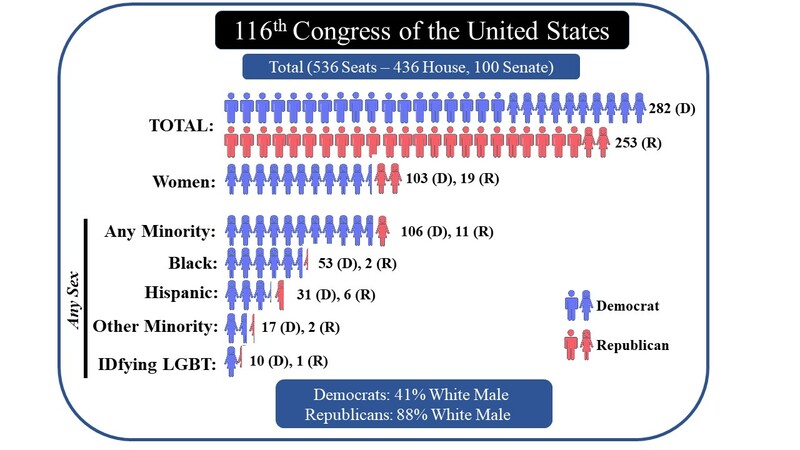 Demographics of the 116th US Congress. If you’re a rich, white male, you’re WELL represented. If you’re primary mission life is the acquisition of wealth, you’re well represented. If you’re a minority? A woman? Well, you’re kind of screwed. OK, I admit it. I often don’t have the patience to scan through large flocks of gulls to find the “oddball”, the one that ISN’T the seemingly ever-present Ring-billed Gull (here in South Dakota). Sometimes, however, you see something that’s clearly so different than you can’t help but notice. 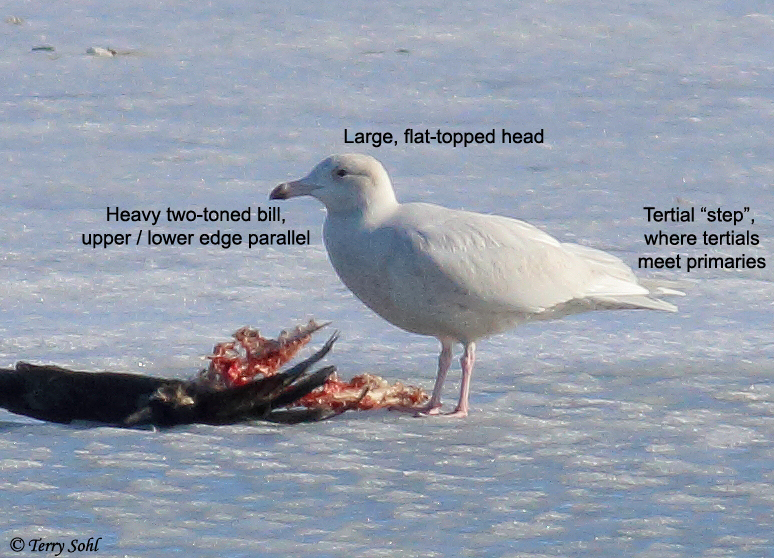 That was the case yesterday near Pierre, South Dakota, when I saw a large, nearly all white gull sitting on the ice. My first thought when seeing the bird from a distance…Iceland Gull, since recent bird reports had frequently mentioned an Iceland Gull being seen in the area. At first glance, that seemed to “fit”. However, as one who isn’t well-versed in the dark art (I’m think of you Ricky Olson!!) of multi-age gull discrimination…I wasn’t sure. It wasn’t until I got home, downloaded the photos, and did some sleuthing where I think I can safely call this an immature (probably 2nd winter), quite pale Glaucous Gull. Why? Immature Glaucous and Iceland Gulls both share some characteristics that were evident in this bird. 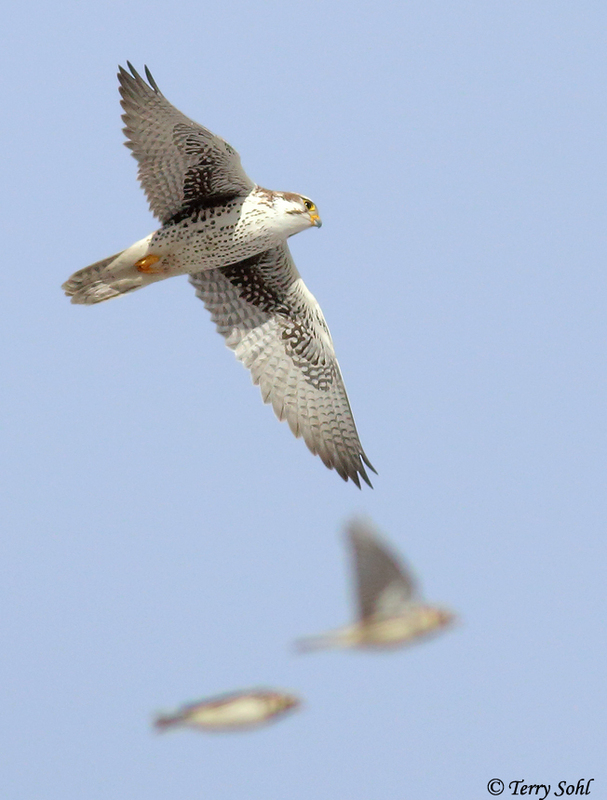 1) Pale overall, including pale wingtips without markings. 2) two-toned bill. 3) pink legs. 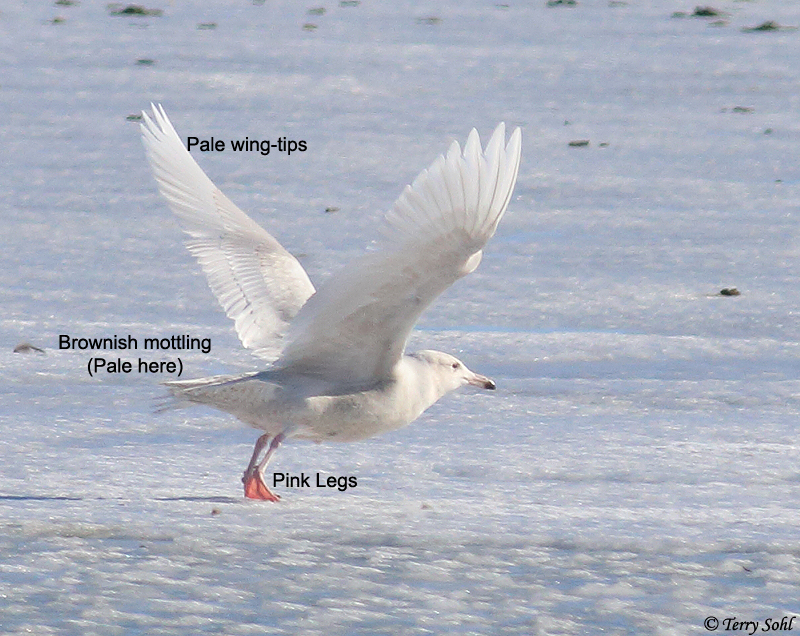 However, when looking at Sibley’s and online resources, it’s clear the bird has characteristics of a Glaucous Gull. First…the bird’s size. There were a handful of Ring-billed Gulls around, and this bird was clearly larger. Much larger. 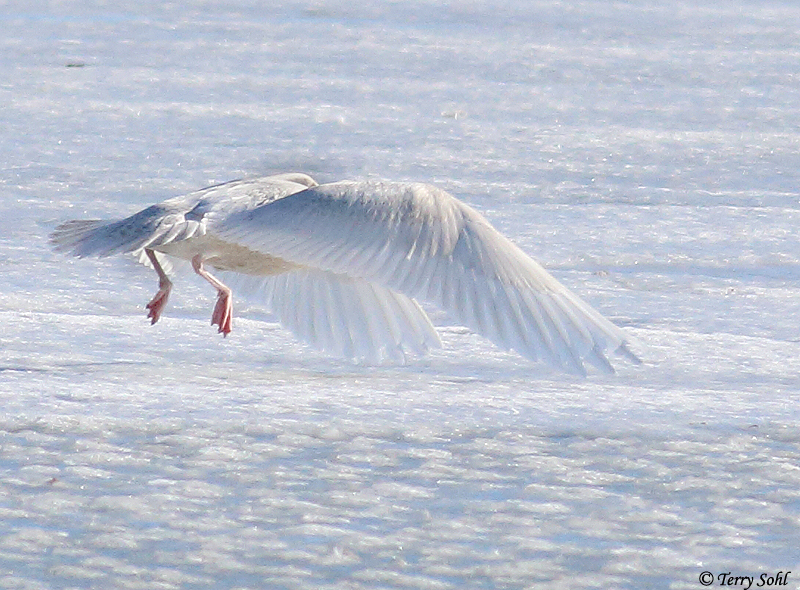 Iceland Gulls are larger than Ring-billeds, but Glaucous Gulls are MUCH larger. With the distance between the Ring-billed Gulls and this gull, it was a bit difficult to judge, but it really did look a much, much larger bird than the Ring-billed Gulls. Secondly…the head. From this excellent site (South Dublin Birds), it’s noted Glaucous Gulls have a large, flat-topped head, while Iceland Gulls have a more delicate looking, rounded head. This bird clearly has the head shape of a Glaucous. 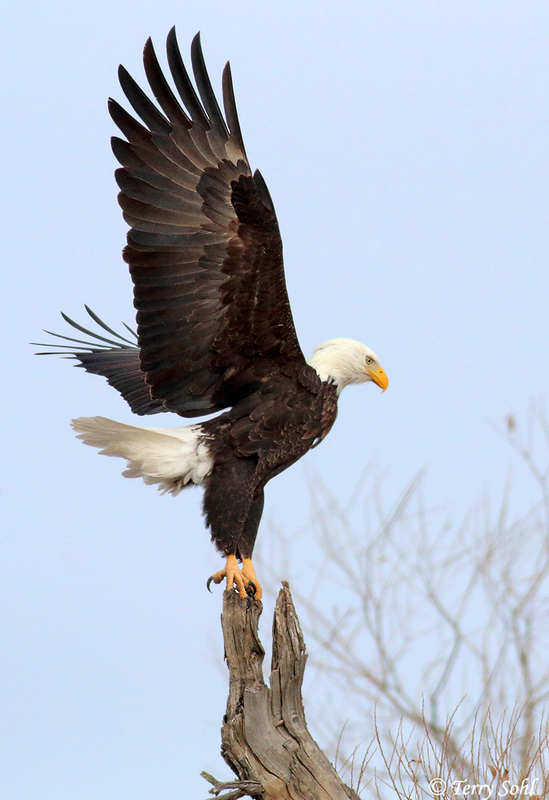 Also…that site is the only one I found that notes a “tertial step”…a clear angle where the tertial feathers on wings meet the primaries when the wing is folded as in the first photo below. Here, you definitely see a clear “step” down where the tertials meet the primaries. Finally, the bill. Young Glaucous and Iceland Gulls both may share a two-toned bill such as this, but the Glaucous Gull has a heavy, longer bill, with parallel top and bottom edges. The Iceland Gull has a much more delicate and smaller looking bill. The bill on this bird is quite large and shaped as a Glaucous. So my final call…a first- or second-winter (probably second), very pale Glaucous Gull. 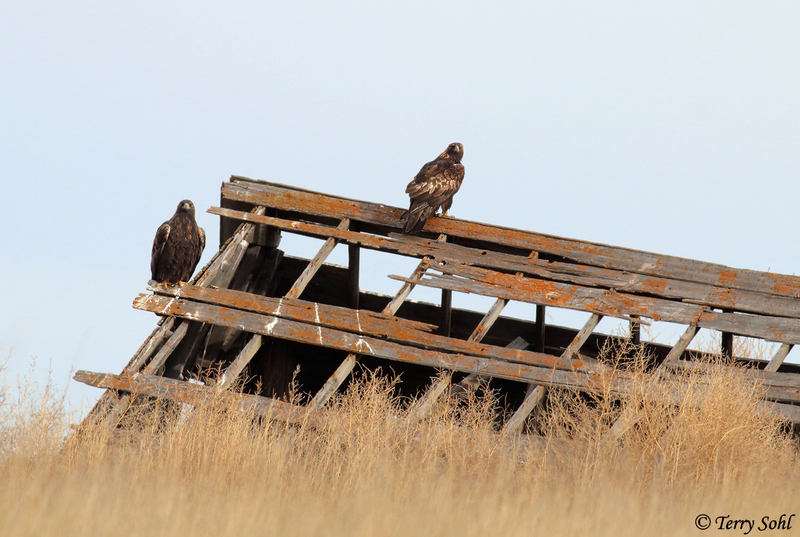 Darker juveniles often have a lot of brownish speckling. 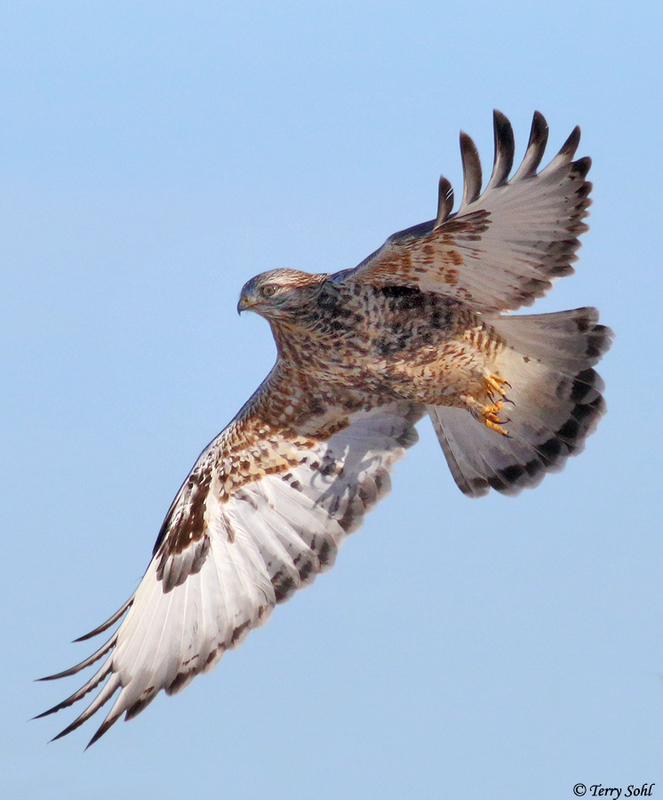 This bird has a very small amount of that, primarily near the tail. Given that Glaucous Gulls gradually lose that speckling and it’s mostly gone by the third year, my guess is its a second-year bird that’s lost most of the speckling. Third winter birds generally already have the pale gray mantle of an adult Glaucous Gull. This bird clearly doesn’t have that yet, so it can’t be a 3rd year or adult bird. In short…the bird looks very similar to the Sibley drawing of a 2nd-winter Glaucous Gull (Page 220 of my Sibley’s guide!). There…that wasn’t so painful! And it was kind of an interesting challenge to ID. Perhaps next time I come across a flock of gulls, I’ll pay a little more attention and do some similar sleuthing! 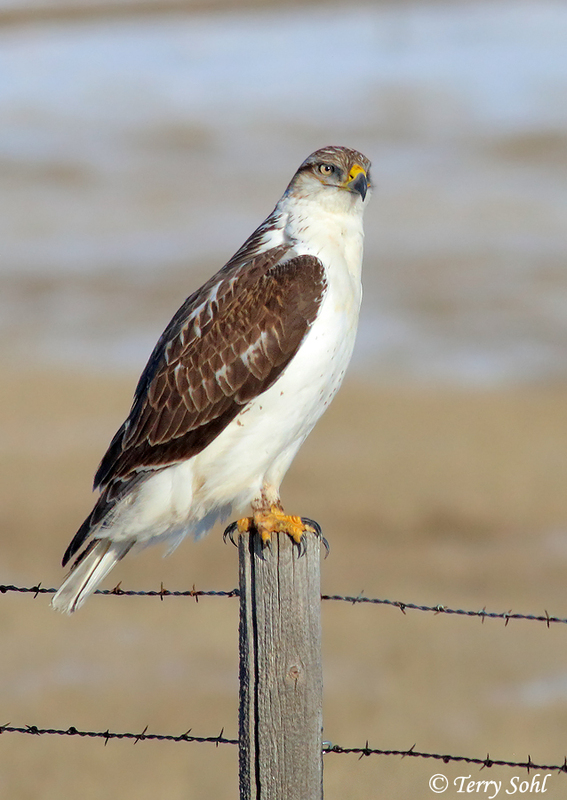 A large, pale gull found near Pierre, South Dakota. Given that others had reported an Iceland Gull in the area, that was must first thought. But upon getting home and seeing the photos in detail, I’m pretty sure now this is a very pale, immature Glaucous Gull. Reasons…1) The heavy two-toned till, with top and bottom roughly parallel. Immature Iceland Gulls also can have a two-toned bill like this, but it’s smaller and more delicate. 2) Head shape…large, flat topped. Iceland Gulls heads are more rounded and smaller looking. 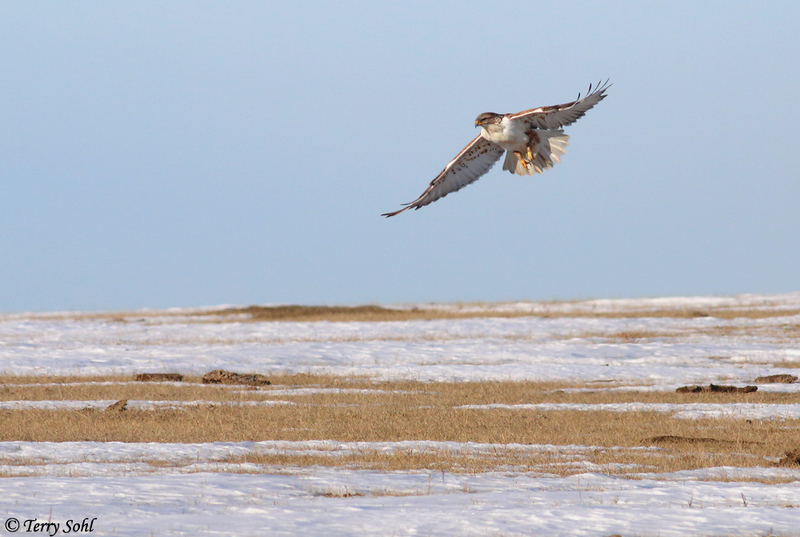 3) “Tertial Step” – an ID characteristic where there’s a distinct “step” where the tertial feathers meet the primaries (unlike Iceland). 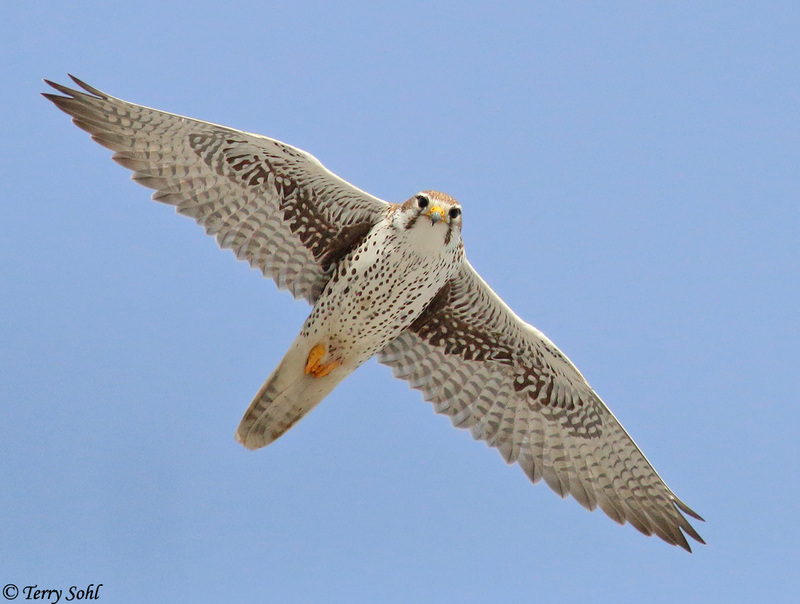 With wings spread, you can see the complete lack of markings on the wings. However, the pale wings, pink legs, and brownish mottling (VERY pale and not widespread on this bird) can be found on both Iceland and Glaucous Gull. Another photo of the bird taking flight, showing the unmarked wings (again, characteristic of both Iceland and Glaucous).